One of the thornier issues of living in two countries and staying in Mexico for extended periods is what to do about a phone plan. As you hopefully are cycling out of your contracts, now is the time to think about what you want in a plan. As you know, "free" phone offers with contracts are nothing more than a long term (2-3 year) installment payment plan for the latest phone. The phrase "locked phone," couldn't be more descriptive in that the carrier "locks" you to the specific plan by giving you a phone that's only operational with that plan. Having a locked phone limits your options when you're preparing to move to Mexico full or part-time. If you live in Mexico, you will quickly see that no expat pays what Americans do for phone service. The great news is that you now have the right to get a phone unlocked for free when your contract expires. It's the law. Next time you buy a new phone, make sure you buy an unlocked one. If you travel, opt for an unlocked dual Sim card phone to give the broadest possible choices for phone plans. If you are still tied to a plan, stop by your carrier's office and find out about its Mexico plans before you leave. They all have them and are moving towards free calling to and from Mexico, the U.S and Canada. You are already paying for the data and it may not cost you any or much more to switch the type of plan that would ensure uninterrupted calling and data while in Mexico. When you return from Mexico, you have to go in and switch the plan back. While not always the most economical, if you have a plan and are staying only a month or two in Mexico, it's about all you can do. If you are anticipating becoming an expat, you'll definitely want to start moving toward something cheaper, without a U.S. contract. Make sure you understand how roaming charges work. I'd heard so many stories about coming home to $500 phone bills due to roaming charges people didn't know they were incurring that I kept my phone in airplane mode during my whole first tour. Ya sabes (you already know) how I feel about telephone contracts and the major carriers. I have described in rather graphic detail my aversion to their small print, hidden charges, marketing practices and their documented data racketeering. It’s the only topic that my friends have to scold me for swearing about. A new AT&T program is helping me hate at least one carrier a little less. The AT&T plan available in Mexico is a no-brainer if you live here over two months at time. For 200 pesos (about US $10) a month, you get unlimited calls and texts anywhere in North America (Mexico, United States and Canada) and 3 GB per data per phone. Certain popular phone apps are not applied toward data usage like Facebook, Whatsapp, Twitter and even Uber. No contract. You have to buy two months (400 pesos/$20) the first time, after that it's month to month for 200 pesos - perfect for the jet setting expat. \Here's what you need to do in Mexico. You go into an AT&T and ask for the plan. They take the SIM card out of your smart phone and replace with theirs, giving you back your SIM card in a little envelope for safe keeping. Should somehow you lose the chip, it's not a catastrophe. To replace the card you go to a AT&T (the main office which any larger Mexican city has) and buy a new one for 800 pesos ($40). They will not have them in the small customer service stores. You receive a new number with the AT&T SIM Card, or you can transport your old number. The number AT&T gives you unlimited calling TO the people in the U.S., Canada and Mexico. People can't call you FROM the U.S or Canada on that number unless they too have an international plan. For them to call you, however, you can use an internet line, like Magic Jack. I ported the U.S. number I've had for years to Magic Jack. My U.S. friends continue to call me on the same number as they always have. You do have to remind friends to call you on the number they always have, regardless of what they see come in. Otherwise, when they see calls coming in from Mexico, they might try to call you on that 52 number. Do not answer as they will pay international rates. Call them back on the AT&T or Magic Jack line. Remind them again. When calling the U.S on the AT&T plan while in Mexico, you do have remember to use the international code, 001, before dialing the number. You are also given a Mexican phone number, beginning with 52, the country code. Once you return to the U.S. you will have to change the Mexican numbers in your contacts directory to include 52, the Mexican international code, if you don't don't want to type the phone numbers in to dial. You can't call directly from your directory unless you change the directory number to include the international code. If you live in Mexico full time and have a smart phone, you can transfer your current Mexico number on the AT&T plan, just like my permanent resident expat friends did. If you’re a part-time expat, you may want to port whatever number your friends and family use to Magic Jack or another internet-based phone service and use their assigned number on your smart phone. Pre-pay the AT&T number in Mexico for all the months you plan to be in the U.S. Ten dollars a month for unlimited local calling and calls to Mexico, plus the data, beats anything you've seen available in the U.S. by quite a margin. The best part of the AT&T plan in Mexico is that before you go back to the U.S., you can pre-pay the $10 a month for each month you anticipate being in the U.S. You will still have free calling to the U.S., Canada and Mexico and the data. That means you can call your U.S. friends when you're home on the plan. Before leaving Mexico for the U.S., I always pre-pay the plan for the months I am to be in the U.S. AT&T in Mexico is sometimes more generous about throwing in free minutes when you have pre-paid. If you stay longer than planned in the U.S. and the plan runs out, a second choice would be Team Mobile's $53 a month, no-contract plan. Then you'd have to replace the chip with the original chip and purchase the calling/data month to month. To summarize my part-time expat system: I purchased Mexico’s AT&T plan for $10 a month. I get three gigs of data and can call anyone in the U.S and Mexico from either country as well as receive texts. I ported my old U.S. number to Magic Jack and can still make and receive calls and texts from the U.S. for free over the internet. U.S. friends call me on the number they always have, which is now an internet-based phone line. AT&T, Telcel, Movistar and Virgin Mobile currently offer a month-to-month plans (no contract) for MXN$200 pesos (US$11) that includes unlimited call minutes and SMS messages across North America (Mexico, the US and Canada), and at least 500 MB of data. An additional 1 GB of data is included for use of Facebook, Twitter, and WhatsApp. Visit the websites of the mobile operators to learn about these new unlimited plans which offer good value for money. You've got to think outside the box when you live the part-time expat life. The main thing I wanted for my expat lifestyle was free international calling, some data, free internet calling options and no contracts. Using a combination of Magic Jack or another internet phone service (or WhatsApp) and AT&T's $10/month plan has been the solution for the last two years of hopping between countries. If I average out the cost of the phone I bought online ($250), the $10 a month for the AT&T plan, a few dollars a month for the Magic Jack service, and a few dollars keeping a cheap Telcel phone number active, the monthly total is less than $25 a month (based on using the same smart phone for three years). At times, people squawk about my system, “It’s too complicated.” All I know is that where I used to have a hard time keeping my phone bill to under $115 a month even without international travel. Now I can communicate on various platforms between two countries for less than $20 a month. The story of my weird Telcel phone - You may want a wierd phone here too! When I first moved to Mexico, I bought a $35 Telcel phone in which to keep Mexican contact names, cab driver phone numbers and all things Mexican. I regularly put sueldo on it, paying 100 pesos every few months at the OXXO to keep the number, or ask my business associate, the Intrepid Elise, to put a few pesos on it once in awhile for me while I'm gone (That she says not-a-word about doing this signals to me a certain level of endorsement of my plan). I've had the primitive little device for four years now. I could have transferred that Telcel phone number to my smart phone with the new AT&T account, giving me one Mexican number. I keep the Telcel phone and number for a number of fun reasons. First, it’s first phone I had in Mexico. It’s the one my Mexican friends have always called me on when I'm there. When that little phone rings, I know it's a Mexican on the other end. It's my Mexican Bat phone. Second, I've grown rather fond of it. The palm-sized phone is like a little landline that fits in the front pocket of my jeans. No one's going to steal it. It fits into the smallest of pockets. Third, I've even had the occasion when my smart phone ran out of battery, necessitating calling a regular cab on the Telcel phone when I couldn't access Uber. This kind of little emergency phone is handy to have in a foreign country. Fourth, these phones are indestructible. I can't count the number of times I've dropped it, picked up the pieces from one of the ceramic floors that covers the entirety of Mexico, and fired it up again like nothing happened. One of the hardest transitions to make in assuming the part-time expat lifestyle was creating a phone system that costs next to nothing yet still gave me what I needed. Consider what you really need in Mexico vs. what you're simply used to in the U.S when you put together your own system for part-time expat life. You will likely save a boatload of money. Next up: Day of the Dead far more nuanced than our Halloween. Most recent: Living in Mexico keeps you from impulse buying online. Don't think you do shop on impulse? If you bought electronics or clothing, you most likely did, according to studies by retailers. 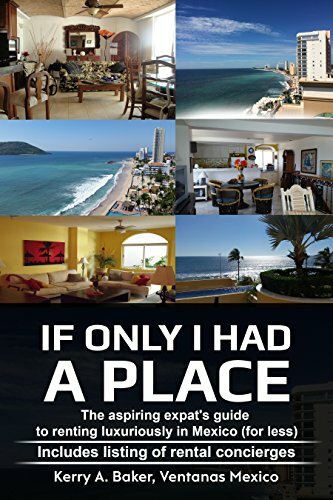 Kerry Baker is a partner with Ventanas Mexico and author of two books, "If Only I Had a Place" on how to rent luxuriously in Mexico as an aspiring expat. The book includes a listing of rental concierges in the most popular expat destinations. Renting in Mexico is different. Make the most out of the advantages, avoid the pitfalls with this book. 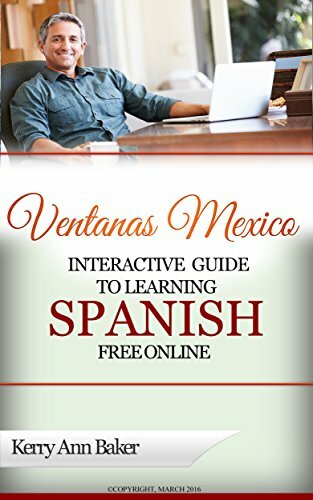 Her first book is The Interactive Guide to Learning Spanish Free Online, taking you to the best free tools on the web. Don't be that expat who doesn't speak any Spanish! The Interactive guide takes you directly to the best free features and sites (some in Spain) that you will never find in a Google search. Study from your laptop, e-reader or tablet, like the Amazon Fire.